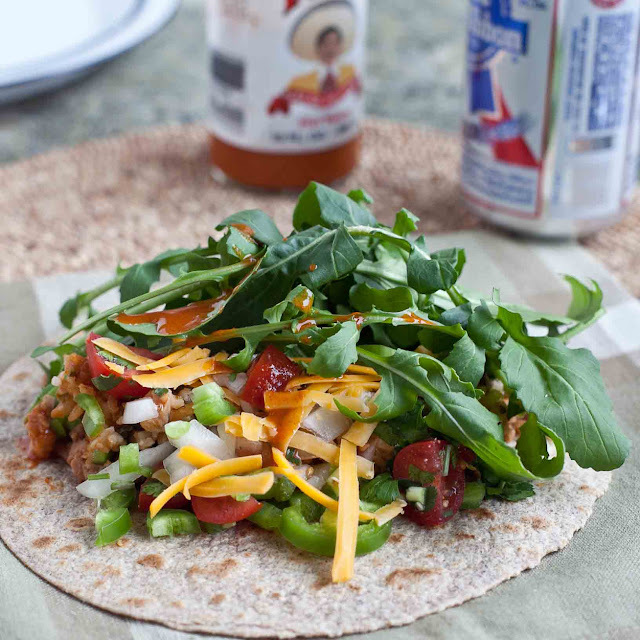 If you often look for something easy, fast and tasty to make for your football watchers, you might like these Game Day Big Tacos with Arugula. When I got home from the market yesterday, my husband had been working in the yard all morning and was ready to come in for some lunch and watch some football. "Do we have anything for lunch?" How about a bean burrito? 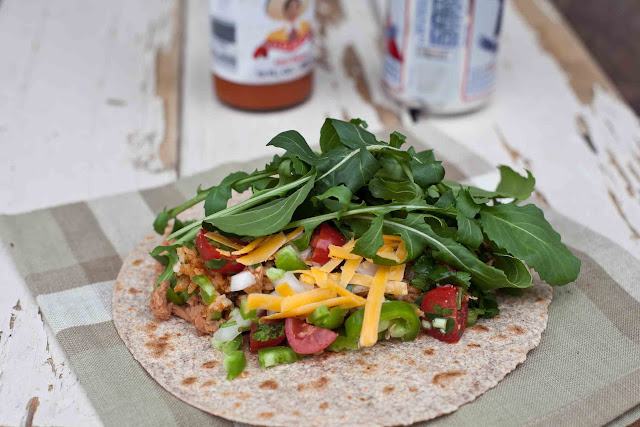 The bean burritos turned into Big Tacos--we could only fold them in half. After pre-heating my comal--a flat, round, caste iron pan made to heat tortillas given to me by my friend Sue, I cook the tortillas until they're slightly crisp on the outside, but still chewy on the inside. Then I put a smear of refried beans, which I heated in the microwave. I added a small scoop of leftover Spanish rice (or other leftovers make it interesting), pico de gallo and a little cheese. 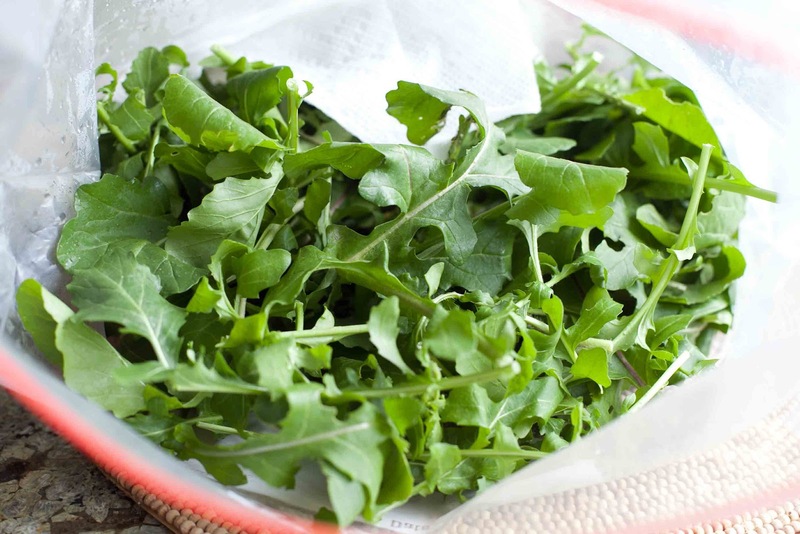 When I visited my parents the other day, they gave me a big bag of arugula my dad grew--all washed and ready to go. Thanks, Mom and Dad! Pile the arugula on--I think that's what makes it really good. I try and start out small so I can roll them like a burrito, but they end up big so they turn into big tacos. The last couple of days I've been using this table for photos. I've been asking my husband to make me some table tops for variety in my food photography, and he's suggested several times to use the table in the garage. He took half of the stuff on and around the table away, and I cleared off what was left--the bucket of gardening tools, balls of twine, bicycle pumps, car and dog washing stuff and dragged the table outside. Gary was right, it worked well! 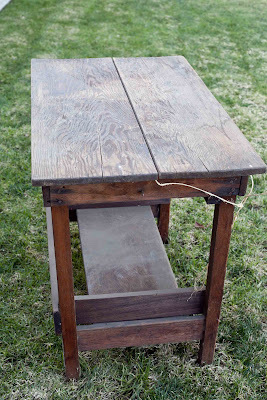 Years ago, we rescued this table from his parents' house--it was in an old, musty shed in their backyard they called The Dog Bear. I think the name has something to do with how tool shed is said in Japanese--dougu beya. 'Dog Bear' is what it must have sounded like to all the Fujimoto kids--so that's what they've always called the shed--The Dog Bear. My sister-in-law from Japan finds the linguistic interference so amusing. Gary says he remembers one of the kids (maybe himself) writing "Dog Bear" on the door of the shed in chalk. This table is the one that my husband's parents used as their kitchen table when they were first married, over 60 years ago! Have you enter our Giveaway yet? 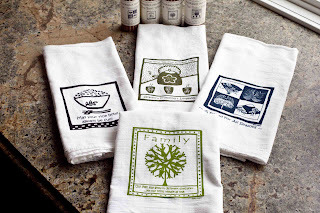 To celebrate our 1st anniversary of blogging, we're giving away 5 sets of two tea towels made by Cheryl Ann Okamoto of Cato Crafts. 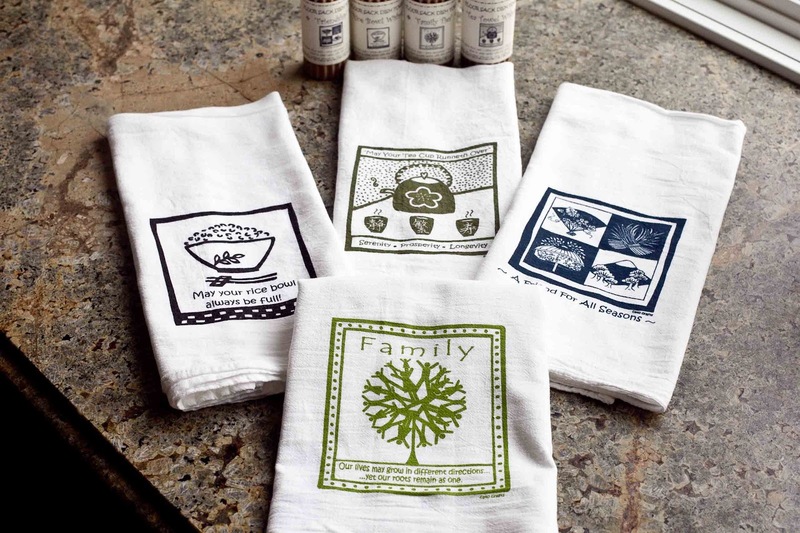 Each set will contain one 'Family' towel plus a random choice of one of the other three designs. Just leave us a comment at the end of our anniversary post, Top Ten Posts for 2011. You can enter until the Lunar New Year on January 23, 2012. Put the refried beans in a bowl and heat them in the microwave. Also heat any leftovers that you think might be good/interesting in a taco. Mix together the chopped tomatoes, onions, jalapeños and cilantro with a squeeze of lemon and season with salt and pepper to make pico de gallo. Grate cheese. 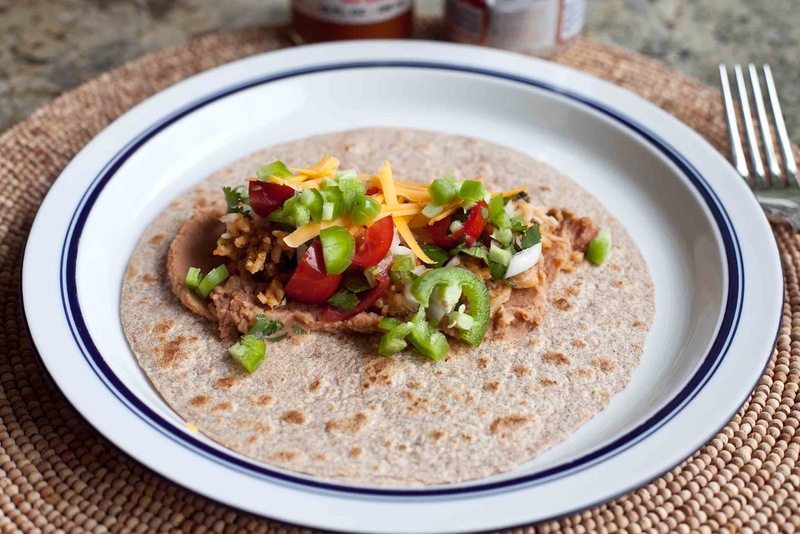 Heat the tortillas on a comal, caste iron skillet or pan until crisp on the outside but still chewy on the inside. Layer beans, rice (or other leftovers), pico de gallo, cheese and arugula. Serve with your favorite hot sauce. Wow, those look like some excellent and relatively healthy nachos! Would love to try making these sometime. Also, wondering if you have ever tried a bench stone on your knives and blades? It would definitely help you achieve a smaller, more fine cut on your vegetables and other produce. I would definitely recommend the DMT culinary bench stone to keep your blades sharp if you're interested. Just wanted to share!